Preparation is good. Moving from the big city to a little mountain village taught me PREPARATION. I have: seen the wind take out the local power grid for days, woken to a 5 foot snowfall, heard that the food supply truck can't get through the pass for the delivery to the grocery market, been 45 miles from home (after dark in the boonies with no cell coverage) when the bearings in my right front wheel disintegrated... PREPARATION, Preparation, preparation. I have used other freeze dried food and was introduced to THRIVE foods while checking out their cool food rotation system. Holy smokes, I was very impressed. Having some freeze dried food in the event of an emergency is one thing. But I use Thrive freeze dried food in about 50% of my everyday cooking. From Tuscan Chicken, gormet sauces and herbs to fresh baked bread and the fruit is decadent for the top of my home made Pavlova. The food tastes great, it is so convenient, things I used to have to go to the grocery store for every few days are in my pantry saving me time. There is no waste. No more finding food gone bad in my frig! I take out of the can what I need and put the can back in the pantry. I can open a can of berries or sausage and come back in 9 months and it is still great tasting and nutritious. That saves me money. Let me help you build a home pantry of THRIVE for your every day cooking. You will love eating great tasting nutritious food, thats convenient. Or if building food storage for your family is important I can get you on track and help you make that happen. 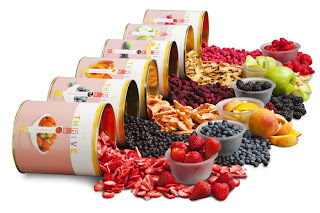 FREEZE DRIED - a process that locks in the nutritional value, taste, color and freshness of each THRIVE food, allowing you to enjoy the same great taste for years to come. Just barely cover the freeze dried food with water, wait 10 minutes and it is ready to eat. The meats are all cooked, no fat or skin, pure meat! No more washing, peeling and cutting up veggies! LONG LASTING HIGH QUALITY with a sealed shelf life of up to 25 + years and an opened shelf life of 6-24 months. AFFORDABLE and the same foods you would purchase at the market. We throw away about 25% of the food we buy. So if you spend $400 a month on food, you are throwing away about $100 a month. The amount of food that gets tossed from our refrigerators is huge. Think about taking that 25% and get on a monthly Q and purchase the foods your family normally eats delivered to your door. No more running to the store for a gallon of milk and leaving the store having spent $30. CONVENIENT and can be used right out of the can, from your pantry, which will save you valuable time. Imagine how convenient it will be to skip preparation steps like chopping veggies and browning meat. With THRIVE, much of the work has already been done for you.